QNX Auto Blog: BlackBerry QNX’s self-driving Lincoln MKZ – what’s under the hood? BlackBerry QNX’s self-driving Lincoln MKZ – what’s under the hood? At CES 2017, BlackBerry-QNX unveiled its self-driving Lincoln MKZ. In years past , BlackBerry QNX has become known for displaying its innovative technology in its concept cars, which included infotainment, mobile device connectivity, digital instrument clusters and ADAS. 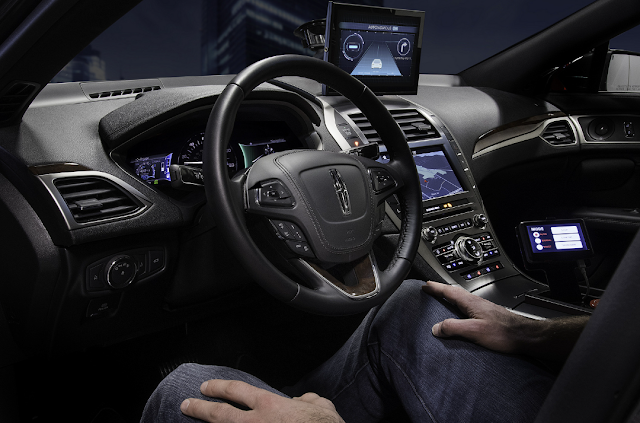 This year BlackBerry QNX has outfitted a Lincoln MKZ to demonstrate a self-driving vehicle. The Lincoln MKZ is much more than a demonstration vehicle – it is an engineering prototype that allows BlackBerry QNX engineers to experiment with and develop new technologies for the autonomous vehicle market. You may wonder why BlackBerry QNX chose a Lincoln MKZ for its autonomous driving car. The reason is straight forward. The 2017 Lincoln MKZ comes equipped, from the factory, with all the necessary drive-by-wire capabilities. All of the driving systems (throttle, gearbox, steering and braking) can be completely controlled electronically. By using this capability as a starting point, BlackBerry QNX and its partners are able to focus on adding other self-driving capabilities such as the sensors, route planning, and maneuvering. While providing the foundational software, BlackBerry QNX did not build this self driving vehicle alone. We worked closely with Renesas, University of Waterloo, Polysync and Cogent, to put the car on the road. BlackBerry QNX’s goal was to build an autonomous vehicle using commercial embedded processors and safety certified embedded operating system (OS). At the core of the design was QNX’s safety certified OS, which powers all of the intelligent software modules. QNX’s middleware serves to integrate RADAR, LIDAR sensors , multiple camera inputs and vehicle networking. BlackBerry QNX provided a port of the OpenCV library to help with the vision processing functions delivered by Cogent. BlackBerry QNX also provided a port of Robot OS (ROS), so that the University of Waterloo could easily bring their self-driving software algorithms to the car without having to re-write large portions of code. The ROS software components are not truly embedded, production oriented software. However, in building an autonomous car we chose a phased approach. We chose to use existing software to test and validate the solution. This saves time and allows flexible prototyping. Once the code is finalized we can convert it into an embedded solution. The University of Waterloo, one of Canada’s leading autonomous driving research institutions, contributed several software components, including static and dynamic environment perception, path planning, maneuvering and dispatching control commands to the various actuators. It should be noted that, at the outset of the project, the University of Waterloo already had a number of these components operational. Part of the activity was to port the software from Linux to QNX – a task made simple by BlackBerry QNX’s support for the POSIX standard. Polysync provided their framework for distributed communications and sensor integration. They also provided system data visualization tools, so the engineers could see how the system was operating from a central console. Cogent provided a number of vision processing algorithms that processed input from multiple camera sensors. The compute horsepower in the Lincoln MKZ comes from two Renesas R-Drive reference boards. Each Renesas R-Drive board has two Renesas R-Car system on chips (SoCs), each with quad-core ARM processors and image processing accelerators. Two R-Drive systems were used so that fail-over scenarios could be tested. The car is now running on a test track. In the following years BlackBerry QNX will continue to refine the system towards production oriented hardware and software.